To celebrate the 50th webcast of CBS Interactive’s award-winning live webcast concert series, “Live On Letterman,” KISS will bring their spectacular, larger-than-life extravaganza of music to the world famous Ed Sullivan Theater in New York City. The concert will be webcast live and available on CBS.com and VEVO, Wednesday, Oct. 10 (8:00 PM, ET/5:00 PM, PT). KISS will perform fan favorites from their treasure-trove of hits along with their recent single, “Hell or Hallelujah,” from their new album, "Monster," which will be released October 9. Having already broken box office records set by The Beatles and Elvis, KISS celebrates their 40th anniversary in 2013 with more than 28 U.S. gold albums, the most gold records for any American rock band, with 40 million sales in the U.S. and a total exceeding 100 million worldwide. 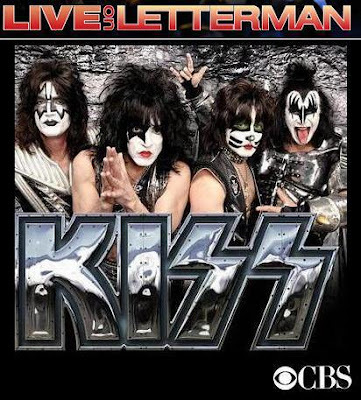 The “Live On Letterman” franchise, which has surpassed 130 million views to date online, marks its 50th webcast with KISS’ performance. Past performances have included some of the most established bands and musicians across the globe, from its first event which featured Pearl Jam, to Paul McCartney on the marquee of the Ed Sullivan Theater, Foo Fighters, Katy Perry, Coldplay, Adele and more, all staged in an intimate and dynamic setting for worldwide followers to enjoy. Fans can watch KISS’ webcast live or on-demand on CBS.com here. KISS’ “Live On Letterman” webcast will precede their appearance on the Late Show with David Letterman, which will be broadcast that same evening, Wednesday, Oct. 10 (11:35 PM-12:37 AM, ET/PT) on CBS.